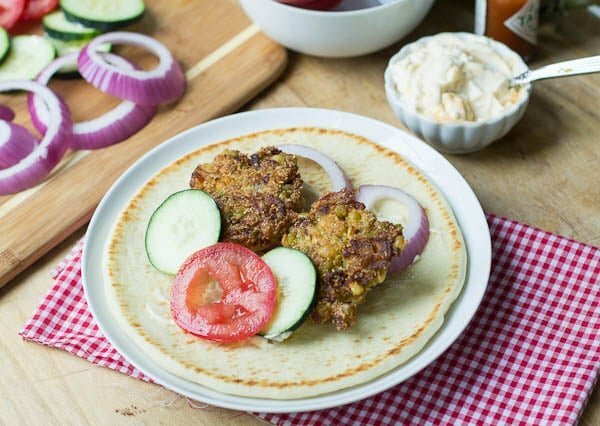 This Southern Falafel recipe is a tasty southern twist on the classic Middle Eastern Falafel Sandwich using field peas instead of chickpeas. During the summer months, many different varieties of field peas can be found at farmer’s markets throughout the south. Any variety will do for this. I used one called White Acre which is a small field pea with a mild taste. They were a little bit of a bear to mash. But I was using a fork which is not the most optimal mashing tool. It would have been easier to use a food processor, but at least I got an upper body workout in. If you’d like to learn more about field peas, Southern Living has a good Guide to Summer-Fresh Field Peas. When forming the patties, it really didn’t seem like there is enough binder to hold them together and I expected them to fall completely apart in the oil. But they held together very well as soon as they were in the oil. It may be helpful to refrigerate the mixture first before forming the falafel. I also didn’t do the best job of mashing my peas which I am sure made the task of forming the falafel more challenging. 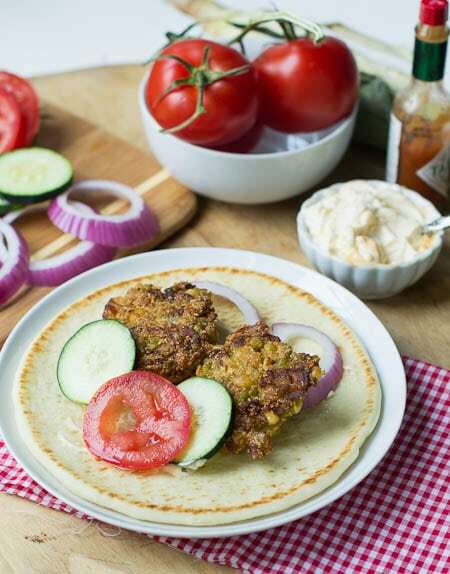 A little country ham, sweet onion, and corn add a nice southern touch to the falafel. Served in fresh pita bread, spread with spicy mayo, this is a delicious and nontraditional lunch. If there are any leftovers, they heat up well a day later. Note: You could easily leave out the country ham and make this a vegetarian meal. 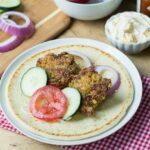 A southern take on falafel made with field peas and country ham. Place mashed field peas in a medium bowl and set aside. Heat 1 tablespoon oil in a nonstick skillet and sauté onion and country ham 2 to 3 minutes. Add garlic and cumin and sauté 30 more seconds. Let cool slightly. Add onion and ham to bowl with field peas along with egg, tahini, corn, cayenne pepper, and salt. Mix together well. In a small bowl, combine cornmeal, baking powder, and black pepper. Stir to mix and add to field pea mixture. Mix together and form into 2-inch patties. In a nonstick skillet, add ½-inch worth of oil and heat to 375°. Fry patties in batches for approximately 2 minutes per side. Drain on paper towels. In a small bowl, combine mayonnaise, lime juice, and hot sauce. Stir well. 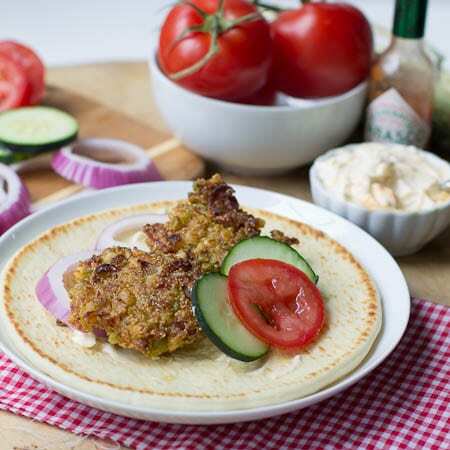 To serve, spread spicy mayo on pita bread, top with 2 or 3 falafel and desired amount of red onion, cucumber, and tomato. This entry was posted in Sandwiches and Wraps and tagged falafel, field peas, sandwiches, southern food. Bookmark the permalink. CC! what a terrific idea! very inspired. I love felafel and I your take on it sounds delish! So at the risk of sounding like a fangirl, I LOVE ALL OF YOUR IDEAS. The Southern twist is so well-incorprated in all of your recipes, this one included! Believe it or not I’ve never had falafel. So sad – I know!! Looks so good! I’m ashamed to say I don’t know what a field pea is…but I love falafel and so know that this must be completely delicious! using peas is such a great idea… i always use chickpeas. love falafel.